The Power Rangers will have to outsmart a puzzling villain, save a prince, and try to defeat Sledge's monsters. When the evil Fury unleashes the powerful Ptera Zord, only the Power Rangers can regain control with the help of their newest ally: the Gold Ranger!.. Power up with six incredible teens who out-manoeuvre and defeat evil everywhere as the Mighty Morphin Power Rangers! But this time, the Power Rangers may have met their match when they face off with most sinister monster the galaxy has ever seen - Ivan Ooze. Unleashed upon the good citizens of Angel Grove after six thousand years of imprisonment. Ivan Ooze strips the Power Rangers and their leader, Zordon, of their powers. 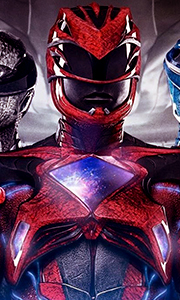 Now the Power..
Saban’s Power Rangers follows five ordinary teens who must become something extraordinary when they learn that their small town of Angel Grove – and the world – is on the verge of being obliterated by an alien threat. Chosen by destiny, our heroes quickly discover that they are the only ones who can save the planet. But to do so, they will have to overcome their real-life issues - before it is too late, band together as the Power Ranger..
Own Power Rangers DVD from Deff, DVD, Blu-Ray & 4K Video Specialists - Free UK Delivery..
Own Power Rangers - Dino Charge - The Complete Season DVD from Deff, DVD, Blu-Ray & 4K Video Specialists - Free UK Delivery..
Get charged up and unleash the mighty strength of the dinosaurs with the Power Rangers Dino Charge! Centuries after an evil intergalactic bounty hunter named Sledge tried to get his hands on the mysterious Energems, a new team of Rangers have unearthed the Energems and bonded with their powerful dinosaur spirits. With the help of Dino-Charged weapons, new Megazords, and teamwork, they must protect these Energems at all costs from Sledge..
Own Power Rangers - Dino Charge - Volume 2 - Resurgence DVD from Deff, DVD, Blu-Ray & 4K Video Specialists - Free UK Delivery..
Own Power Rangers - Dino Charge - Volume 4 - Rise & Halloween Special DVD from Deff, DVD, Blu-Ray & 4K Video Specialists - Free UK Delivery..
Own Power Rangers - Dino Charge - Volume 5 - Hero & Christmas Special DVD from Deff, DVD, Blu-Ray & 4K Video Specialists - Free UK Delivery..
Own Power Rangers - Green With Evil DVD from Deff, DVD, Blu-Ray & 4K Video Specialists - Free UK Delivery..
Own Power Rangers - Megaforce - Volume 1 - Ultimate Team Power DVD from Deff, DVD, Blu-Ray & 4K Video Specialists - Free UK Delivery..
Own Power Rangers - Megaforce - Volume 2 - The Great Dragon Spirit DVD from Deff, DVD, Blu-Ray & 4K Video Specialists - Free UK Delivery..
Includes 7 Episodes: Rico The Robot Staying On Track The Human Condition The Messenger End Game Raising Spirits - Halloween Special The Robo Knight Before ChristmasIn the shadow of an impending alien invasion, Troy, Noah, Emma, Gia and Jake must battle their greatest enemies in these final duels! With the help of Robo Knight, the Ultra Gosei Great Megazrd, and all of their Power Cards, the Power Rangers race against time to defeat a r..
Own Power Rangers - Megaforce Two Volume Collection DVD from Deff, DVD, Blu-Ray & 4K Video Specialists - Free UK Delivery..
Own Power Rangers - Samurai - Christmas Together Friends Forever DVD from Deff, DVD, Blu-Ray & 4K Video Specialists - Free UK Delivery..
Own Power Rangers - Samurai - The Complete Season 1 DVD from Deff, DVD, Blu-Ray & 4K Video Specialists - Free UK Delivery..
Own Power Rangers - Samurai - Volume 1 - The Team Unites DVD from Deff, DVD, Blu-Ray & 4K Video Specialists - Free UK Delivery..
Own Power Rangers - Samurai - Volume 2 - A New Enemy DVD from Deff, DVD, Blu-Ray & 4K Video Specialists - Free UK Delivery..
Own Power Rangers - Samurai - Volume 3 - Team Spirit DVD from Deff, DVD, Blu-Ray & 4K Video Specialists - Free UK Delivery..
Own Power Rangers - Samurai - Volume 4 - The Ultimate Duel DVD from Deff, DVD, Blu-Ray & 4K Video Specialists - Free UK Delivery..
Own Power Rangers - Super Megaforce - Volume 1 - Earth Fights Back DVD from Deff, DVD, Blu-Ray & 4K Video Specialists - Free UK Delivery..
Own Power Rangers - Super Megaforce - Volume 2 - The Perfect Storm DVD from Deff, DVD, Blu-Ray & 4K Video Specialists - Free UK Delivery..
Own Power Rangers - Super Megaforce - Volume 3 - Legendary Battle DVD from Deff, DVD, Blu-Ray & 4K Video Specialists - Free UK Delivery..
Own Power Rangers - Super Samurai - Volume 1 -The Super Powered Black Box DVD from Deff, DVD, Blu-Ray & 4K Video Specialists - Free UK Delivery..
Own Power Rangers - Super Samurai - Volume 2 - Rise Of The Bullzooka DVD from Deff, DVD, Blu-Ray & 4K Video Specialists - Free UK Delivery..
Own Power Rangers - Super Samurai - Volume 3 - Samurai Forever DVD from Deff, DVD, Blu-Ray & 4K Video Specialists - Free UK Delivery..
Own Power Rangers - The Best Of Blue DVD from Deff, DVD, Blu-Ray & 4K Video Specialists - Free UK Delivery..
Own Power Rangers Dino Super Charge - Volume 2 - Extinction - Episodes 11-20 DVD from Deff, DVD, Blu-Ray & 4K Video Specialists - Free UK Delivery..
Own Power Rangers Dino Super Charge Volume 1 - Roar (Episodes 1-10) DVD from Deff, DVD, Blu-Ray & 4K Video Specialists - Free UK Delivery..
Own Power Rangers Ninja Steel Forged Volume 1 DVD from Deff, DVD, Blu-Ray & 4K Video Specialists - Free UK Delivery.. Both the Power Rangers and Galvanax attempt to find more information about the new mysterious Gold Ranger. Meanwhile, Brody finds himself as the new bodyguard for country music star Levi Weston. Levi is excited to be embarking on his world tour, but as mysterious earthquakes start shaking up Summer Cove, he’s presented with a tough decision… Contains episodes 9-12 on 1 DVD disc. Episode List: Rocking & Rolling The Ranger Ribbon Poisono..
Calvin finds himself increasingly distracted from his friends and Power Ranger duties when he spends all this time trying to impress his local hero. A mysterious princess and her royal guard arrive on Earth to challenge the Rangers, forcing them to band together with a new ally to try and defeat Galvanax’s new champion – but even their teamwork may not be enough. Meanwhile Hayley and Calvin’s relationship is put to the test when they bo..
Own Power Rangers Ninja Steel - Survive (Volume 2) Episodes 5-8 DVD from Deff, DVD, Blu-Ray & 4K Video Specialists - Free UK Delivery..